The first topic on the agenda on Wednesday morning was the exchange on the application of St. Gallen’s Management model. The group discussed the model and how they felt about the application on their organizations. In the gallery discussed in yesterdays blog, each participant as the source of information for each poster explained the different aspects of the model in their organization and had to answer questions from the rest of the group. Half way through this task a bell was rung which indicated a switch over of who would answer questions on the work. This was done by another member of the same working group. Afterwards a discussion was had on the modes of development in the organization. 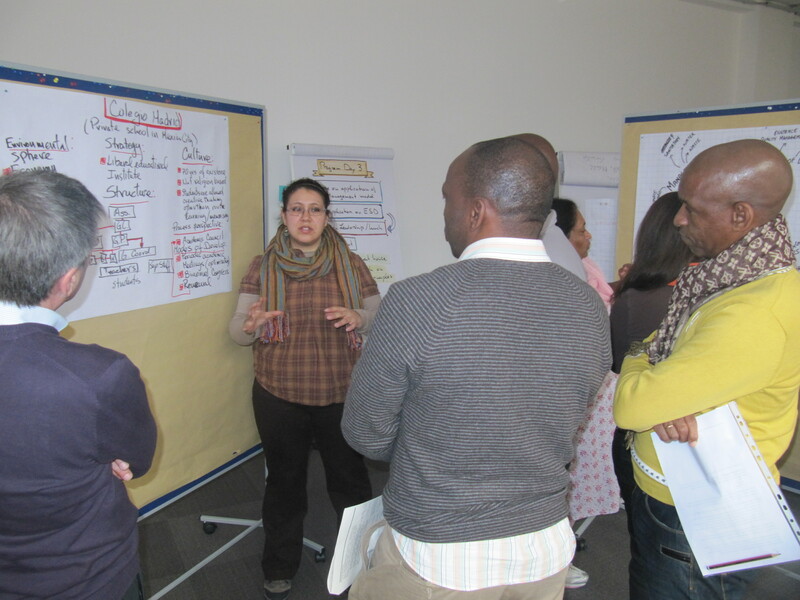 The second part of the day was about applying the St.Gallen’s model to ESD. This involved splitting the participants into country groups and the idea was that if someone came to the participants with the hope of applying ESD in a school they could consult them on how to do so using the model. They would do this by finding a leverage as an entry point and therefore ask which one of the six elements of the model would help with this. They then needed to have recommendations for the chosen entry point after the brainstorming session. The group then took part in a working lunch where Michael Volleman who works for an NGO which provides support for social entrepreneurs. During the lunch an interview was conducted by Ilka Stein which included the popular question “is leadership something that can be learned”. The floor was then open for the participants to ask questions about the work done at his company. Aspects of the interview were then discussed on the groups return to Stratum lounge. There was then an input from Michael Zillach on the topic of the management house. Here he discussed firstly the principles of this model which are seen as the foundations of the house. He then went onto more detail with the management tasks where he broke down their different aspects and these could be seen as the roof of the house. Then acting as the pillars holding the roof up he discussed the various instruments and skills for effective management. The final task of the day was then introduced to the participants by Ilka which was peer to peer coaching for the application of the management house model. Three groups were created, each with a case giver, moderator and 3 or 4 consultants. In this tasks the case giver was first required to give the group an input and key concern relating to the management of their organization. Time was then given for the rest of the group to question the case giver on the concern. The case giver would then be silent as the moderator and consultants brainstormed in order to figure out solutions. Comments were then given from the case giver on the value behind what had been discussed in the brainstorming. To finish this task the entire group gave feedback on the process as a whole which was important for the group as this was a new process for them. There was a shorter closure to the class today as it went on slightly later than usual. Here the trainers discussed how Monday was more about leadership with late Tuesday and Wednesday being dedicated to management. Tomorrow the group will move onto motivation.